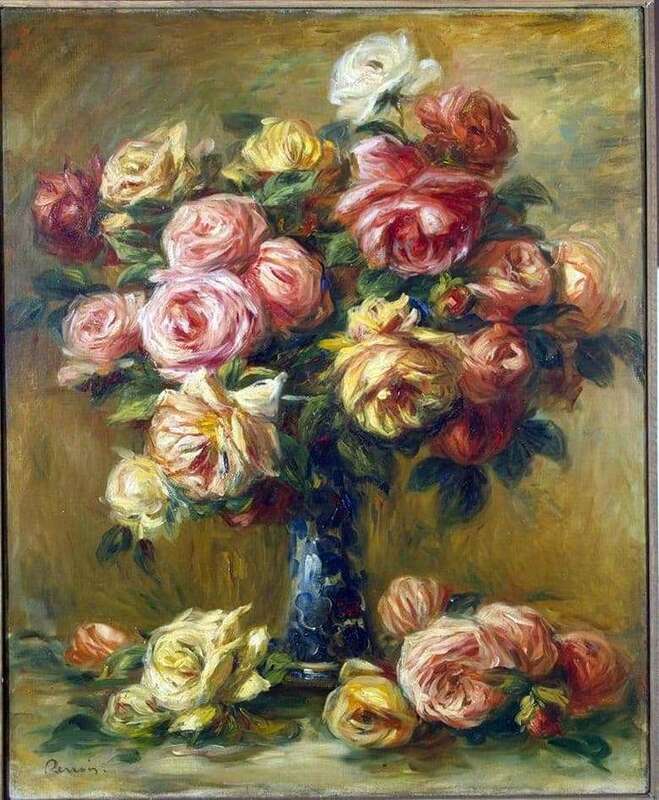 On the slope of his years, the great painter Pierre-Auguste Renoir passionately loved to paint roses. The author tried to convey not so their immaculate external component, and the feeling that causes the flower. Nobility, tenderness, naturalness, inexhaustible beauty of nature – all this is read in the image of roses. Recent pictures of the author are slightly deviated from the usual manner of work. So, transparent strokes, layered layer upon layer on the surface of the canvas were replaced by more confident and thick lines that do not require additional adjustment. Instead of shading and nebula works, more distinct contours and ornate lines characteristic of expressionism emerged. Thus, the natural curves of roses are not transmitted by means of a detailed drawing of the petals and the stem, but by means of smoothly curved lines superimposed on each other in layers. All strokes that use the form of a rose are subject to a single rhythm, which makes the bouquet even more harmonious and complete. The predominant shades on the canvas are pink and orange. Pink buds contain blotches of white, orange, and sometimes even blue. Yellow flowers create a harmonious contrast with rosebuds, embracing white, pink and orange. Darker shades are mainly used to emphasize petal curves and add volume. Lush buds are placed in a thin vase, which can be seen ornament of blue flowers. Under it are several large buds, casually scattered on the table. They have a single color scheme with flowers arranged in a vase. The placement of roses and under the central elements of the picture adds a vividness and realism, with the help of this technique it does not look planar and boring. In general, the image causes delight and thrill before the beauty of nature, thus there is a desire to reach out to the lush buds and touch the infinitely beautiful.